A staggering 80% of the population are using smart devices to browse the internet – so an online business that doesn’t tailor their website to cater to mobile users is simply leaving money on the table. Setting up Google Voice for your business’ phone number can help you take a solid step towards mobile optimization nirvana. For a start, it saves your visitors time, and also cuts out the frustration involved in copy and pasting a number. Also, while click-to-calls arguably lead to a better user experience, there’s no doubt that they offer higher conversion rates for business owners. In this post, we’ll show you how you can set up Google Voice for a business phone number. However, before we begin, let’s take a look at why it’s important to optimize your website for mobile traffic. Over the past few years, mobile devices have become the preferred method of browsing the internet. Regardless of the niche your WordPress website operates in, optimizing for mobile users is essential. Before we get on how to set up Google Voice, here are the key reasons for making sure your website is mobile-optimized. 1.2 billion people currently use mobile technology, so if they’re browsing the internet, it’s likely via a mobile device. What’s more, the number of mobile users is expected to continue growing rapidly in the future. In a nutshell, you’ll need to optimize your website for mobile traffic simply because everybody uses the platform. Mobile content consumption exceeds that of desktop computers, and part of the reason is down to mobile’s suitability for looking up information such as weather updates, news, and sports headlines quickly. Web sites that aren’t mobile-friendly could end up losing traffic, or face an increase in their bounce rate. Your customers don’t just want you to have a mobile-optimized site – they expect it. When surfing the web from different devices, you may have noticed your browsing habits differing from that of your desktop. This happens because people have a tendency to behave differently across multiple devices. For instance, images and short videos are arguably more prominent on mobile, which could impact the user’s habits. Similarly, integrating mobile-ready contact forms enables visitors to connect with your business more easily. Understanding the behavior of mobile users goes a long way in creating a design that’s more accessible to them. Studies show that nearly 80% of social media time is spent on mobile devices. Online business owners who leverage this with social media marketing campaigns can expect a large part of their traffic to be accessing their site through mobile devices. It stands to reason therefore, that web sites lacking in mobile optimization are missing out on the number of visitors they could potentially attract from social networks. On the other hand, websites designed with mobile traffic in mind are often able to draw in more visitors who happen upon their site while browsing their social feeds. There’s no denying that Google’s search algorithm favors mobile-optimized websites. Therefore, the responsiveness and accessibility of your website has a direct effect on its potential to attract incoming organic traffic. Web sites that fail to make their web pages responsive are heavily penalized by Google’s mobile-friendly ranking algorithm. If you’re worried about your own site’s mobile friendliness, you can check out how your site scores by using Google’s easy to use Mobile-Friendly Test. Now we’ve looked at the benefits of mobile optimization, let’s dive deeper into Google Voice, and how it fits into your mobile-optimized website. Google Voice gives online business owners some really useful calling features that aren’t dependent on your mobile device or carrier. These include voicemail transcription, personalized greetings, international calling, conference calls, and number porting. Upon registering, you’ll receive a phone number free of charge that can be set up and customized through your account. For example, you can have all of your incoming calls forwarded to both your personal and work numbers. You can even switch between the phones you’ve configured! You can unite many different phone numbers under a single number. It gives you lots of customization and configuration options to determine how calls are handled. It features voicemail to text transcriptions. From a mobile-optimization perspective, Google Voice eliminates the need for cramming multiple phone numbers onto a small display, and potentially confusing the visitor. By providing a single phone number, you’re giving your customers the greatest chance of contacting you. In addition, mobile users can simply tap the phone number you’ve listed to place a call instantly – and as we said, click-to-call offers greater conversions. It’s clear that Google Voice has some definite benefits for business owners. In the next section, we’ll show you how you can set it up on your WordPress website. We’ve already established that since it’s likely most of your incoming calls will be from mobile devices, it’s important to optimize your website for mobile traffic. By extension, embedding your Google Voice number directly onto your WordPress website enables your visitors to call you by simply tapping on the contact number. Finally, pick a Google Voice number by adding your area code or some word that’s easy to remember to the number given earlier – you’ll be asked to enter a voicemail PIN here – and that’s all there is to it! You now have a Google Voice number set up that you can embed into your WordPress website. Next up is adding the number to your site – and it’s as simple as using the standard text widget. While there used to be a plugin for setting up Google Voice, it’s no longer maintained. Therefore, the only way to embed a contact number is by implementing a few lines of code. However, if the thought of coding sends your head into a spin, don’t worry! We’ll walk you through the process. It’s also worth mentioning here that the proper format for adding any telephone number to your WordPress website is <Country Code> <(Area Code)>-<Local Number>. For example, +1 (234) 567-8901. 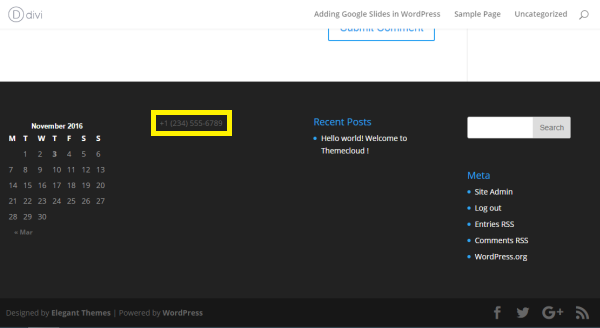 Firstly, navigate to Appearance > Widgets in your WordPress dashboard. From here, browse the widgets under the left-hand Available Widgets section, and look for the standard Text widget. Drag it to the area on the right where you’d like to include the clickable number, and once dropped it will expand to show two fields: Title and Content. However, although this method is simple and straightforward, it doesn’t give you any options to configure your Do Not Disturb settings. If you have a customer support team, and they’re available 24/7 to answer your calls, this will be ideal – but everyone else will want to weigh up whether this method is suitable. Finally, adding a click-to-call Google Voice number is easily implementable using Divi by adding the Code Module to your site. It works in exactly the same way as the widget – by adding the code to the Content field. What’s more, you can further customize the number by adding specific CSS classes using the options at your disposal. Obtain a new phone number from your Google Voice account. Add a text widget (or use Divi’s Code Module) to the relevant area of your site. Paste in a line of HTML code, along with your Google Voice number. Do you have any questions about setting up Google Voice for a business phone number? Get in touch via the comments section below, and don’t forget to subscribe so you can follow the conversation! Article thumbnail image by smilingfresh / shutterstock.com. I haven’t been able to get a local number through Google Voice; what would you recommend for numbers outside North America? Hushed App or RingCentral which aren’t free. Great post! The Google voicemail to text is extremely helpful, even hilarious sometimes. My question is about an attempt to get a second Google number, which ends in default back to my original Google Voice app. I would like separate Google numbers for home and work. Is this possible? Judy, I’m sure that would be possible – but you may have to set up a second account to do so. the google voice website sends me to a FAQ page for gmail chat, not sure google voice still exists? It exists but only in the U.S.
Pedro, Alan said this too, but try voice.google.com. I know we can log on to our google.com/voice page and block those callers, but it would be ideal if there were a way that we could identify those wretched and bothersome callers to Google, and have Google block that number from calling any other Google number. There are apps for smartphones that use crowdsourcing to block calls on your cell phone, but they don’t work for Google Voice, if you have it set to display your Google Voice number (so you can identify a business call coming in). To have your phone number (Google Voice or any other) be click-to-callable in any other place in your website, you can use the same <a href="tel://###…" technique as mentioned above. I haven't tried this on a Divi site yet, but there's no reason it shouldn't work. David, I’m amazed Google haven’t figured this out too, what with their superlative spam email filters. Here’s hoping they implement it soon! First of all, I find phone calls great time wasters. That’s why I like texting so much. I need to know that you’ve picked up the guests but you don’t need to call me to tell me that. Texting is just fine. Other times callers just like to talk forever, costing me money. I would rather call people than them calling me. This way I can prepare before I make a returning call. I can’t get a sales call when I’m down in the engine room working. When a call comes through and they are not on my contact list (or I don’t recognize the number), then I just send it to voicemail. This technique does require you to keep your contact page up to date. I have over 800 contacts and I don’t know half of them. If it is a customer, they usually leave a voicemail message which gets quickly transcribed and sent to my phone via text message. I can clean up, get on a computer, and call them back. If I’m currently working with my team or a client then they take priority over someone calling in. Many years ago I learned that customers would call a store because they knew they could get ahead in a line of customers to ask a question. Companies frowned on this practice and asked the staff to just place them on hold and continue with the customer inline. Google does have spam protection (which it is improving) but like you said, it isn’t as good as crowdsourcing. Many of times I would do a quick Google search for the number to discover that in fact it is a robo caller. Funny how Google has access to the data but don’t use it. The one big drawback of Google Voice is it’s availability. It seems as though a lot of people outside the US want this service, so here’s hoping Google listen! I set up my business on Google Voice five years ago, and it’s been fantastic. It is the easiest and simplest way to keep a unified phone number, no matter where I live in the world – I can always take my work calls in Gmail, and if I’m not working, my cell phone doesn’t ring. Oh, god, don’t tell people to use google voice for business. People get burned hard that way. You get what you pay for. I use GV as my only personal number, but I have heard too many horror stories to use it for a business. Questions for those of you who have used Google Voice for business. If I set up a local number (Google Voice) and have it forwarded to my cell phone, am I able to set up hours that it would transfer and hours that it would go to a voice mail, or do I have to control that on my cell phone? I see one comment above that says not to use Google Voice for business – can you be specific on the ‘horror stories’ you are mentioning? Thanks for everyone’s help – I’m trying to determine if this would be a good option for our small business. Yes you can set up Google Voice to ring a phone at set hours. Even if it rings on weekdays vs weekends. You can set up GV to ring all or some of your other phone numbers and which ever phone you pickup, the all gets routed to that phone. The really cool part is if already have a number in your Contact page, you can make a custom greeting for that number. Example, “Hi Joe, I’m sorry we can’t meet up this weekend. Please leave a message of another time we can meet.” So as you might expect, I’ve programmed many messages. My friends and family think it’s freaky that my GV knows who they are and get a personalized message. In regards of using GV for business, in the past there were many problems. Calls would get dropped, routed to the wrong number, GV would call a friend and play my greeting. For the past two years, I have not seen any of those issues that I had in the past. It’s been really rock solid. I plan on moving all my business off my personal/business google account to a business only system. I will get a new number and look into customer call service to take my calls 24/7. The thing I most like about GV is the number they give you is yours for life. No matter which phone carrier I have, there is just one number people can reach me no matter where I’m at.